Corrick Northwode is a Breton warrior and the sole inhabitant of the farm at Harm's Folly. His wife, Kayleen, was recently killed by goblins and he seeks revenge for her death. His late wife's gravestone is located next to his house and every morning at 6am, he can be found grieving in front of it. At 10am, he will head inside for a three hour lunch, before entering the vegetable garden and using his rake to work the land. He keeps going until 7pm, when he goes back inside, eats his dinner for three hours, and then spends the rest of the evening wandering around his house. At midnight, he finally falls asleep in his bed. 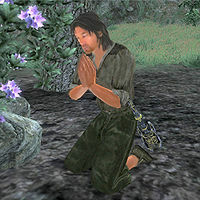 He is armed with a level-dependent mace and wears typical farmer clothing consisting of buckled shoes, a collared shirt, and green felt linens. He also carries a cheese wedge, his rake, a small amount of gold, and the key to Harm's Folly. When approached, his first words reflect his sadness and his desire to seek revenge upon those who took his beloved away from him: "Please... I implore you, help me avenge my wife's death!" He is more than willing to tell you the sad details: "Barely a week ago, I left Harm's Folly to go buy supplies as I usually do once a month. What a fool I was to leave my wife alone. The Goblins must have been watching me, as they knew right when to strike. I could hear Kayleen's screams from far away. Those wretched beasts killed her! Filthy animals! Had I only been there to stop them!" "I'll tell you how you can help. Kill those things. Every last one of them! They destroyed eveything [sic] I hold dear! In their greed, the creatures grabbed a Jade Amulet off of Kayleen's... body. Bring me back that amulet, so I may use it to remember her by." If you had already retrieved the amulet, he will instead announce: "But... this is amazing! I haven't tasked you to bring the amulet back to me, and yet you have. I don't know which of the Divines sent you, but I appreciate what you've done. Those Goblins in Exhausted Mine you got this from killed my poor wife while I was away from home. Now I have my vengeance." When you return from Exhausted Mine, he will thank you for avenging his wife: "Then it's finally done. The Goblins have paid with their blood, and my wife's brutal slaying is avenged. You risked life and limb for a cause that wasn't your own. For that, I'm grateful. Please, accept these gems as a token of my gratitude. They're all I have left of value, but you must have them. I insist." If you greet Corrick after the quest is complete, he will tell you: "Kayleen's grave is outside if you wish to pay your respects." Revenge Served Cold: Help a farmer seek revenge on the goblins who killed his wife. His house is always locked and entering is considered trespassing. If you are inside his house when he wakes up at 6am, he will sit up in bed and start praying until you leave. When you exit conversation, Corrick will mistakenly claim that Exhausted Mine lies to the southeast. In fact it is to the southwest. This page was last modified on 3 January 2019, at 22:47.